SIOUX FALLS, S.D. 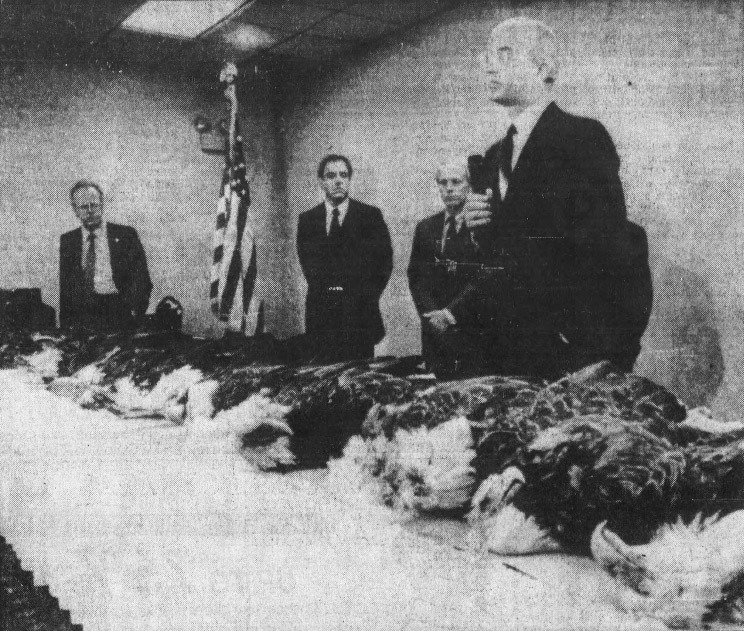 — Surrounded by 23 frozen eagle carcasses, Secretary of Interior James Watt used the display to denounce the destruction of the nation’s wildlife and to show, he said, the disregard some have for game laws. AP Laserphoto. Motivated by an Associated Press photograph that appeared in The Tennessean newspaper June 16, 1983 depicting 23 eagles that had been shot in the Dakotas by poachers, Al Cecere, founder of the American Eagle Foundation, experienced a life-changing moment that redirected his life and aroused his passion to save a precious species. From that moment on, he was determined to do all he could to restore and protect America’s Bald Eagles. After reading that article, he immediately called the Tennessee Wildlife Resources Agency to volunteer his talents and time to raise public awareness and money to keep projects going that would care for these majestic birds. He subsequently established Save The Eagle Project (S.T.E.P.) 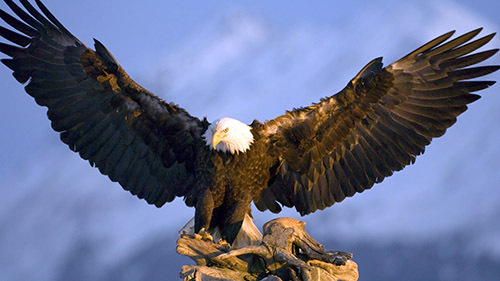 as a non-profit public charity dedicated to fully restoring and protecting the Bald Eagle. The organization’s name was changed to National Foundation to Protect America’s Eagles in 1987, and then to American Eagle Foundation in 2000. Today, the AEF operates the largest eagle breeding and education center in the United States (housed on Dolly Parton’s Dollywood park). In addition, the foundation operates a raptor rehabilitation center for eagles and other birds of prey, which is licensed by the U.S. Fish and Wildlife Service and the Tennessee Wildlife Resource Agency.